Winter brings a lot of pleasures such as family filled holidays and postcard-worthy landscapes, but along with the good, it also brings a dose of inconvenience. Hitting the road in the cold weather can be a hassle at times for various reasons, Fast Car Glass is going to talk about one of those and offer solutions to keep your winter road trips hassle-free. When it’s cold outside and you notice that your windscreen or car glass fogs up the moment you open the door, you may be at a loss of how to fix it quickly so you can get on the road. The first step is to understand why it happens. Fog on your car glass is caused by water vapor condensing on the inner surface. This is caused either by humid air trapped inside or by the humid air that comes out of our bodies while we sit inside the car. It is important to note that if you do not clean it properly it may lead to needing windscreen repair. If you don’t mind a short blast of cold, crank up your air conditioner. This method is most effective when it’s warmer outside and the fog has been caused by body heat and humidity inside of the car. This will clear the fog within a few minutes and you can be back on the road in no time. Another great way to get rid of fog from your car is to “burn” it away. Turn on the heat on your defrosters that are connected to your windscreen, this will make the condensation in your car evaporate the fog. Think of it as how your clothes are dried in the drying machine, the moisture is evaporated leaving your clothes crispy, and the same will hold true for your car glass. This method works best when you can visually see the fog building on the glass in your car as opposed to when all of the windows have already been covered. If there is an extreme amount of fog on your car glass, such as those covered on both sides of the glass, it may be easier to just wipe them down. You can use a terry cloth or a squeegee to remove the moisture buildup and then run your car air conditioner on cool to dry out the rest of the excess. If you are too chilly, start with cold air and slowly raise the temperature to avoid the same foggy result from reoccurring. If you have some great tips on how to defog your car glass and windscreen, we would love to add them to our list. We are always here when you need help with your vehicle no matter what season it may be. 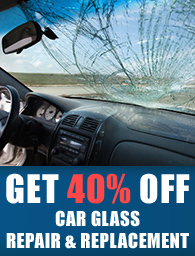 Give Fast Car Glass a call at 7707550375 to find out more.